hello all - we are looking for our first caravan and i am trying to get my head around the legal side of things! I think you have understood correctly. Your licence permits you to drive a car / trailer combination where the MAM of the car and the MAM of the trailer add up to 3500kg or less. Bite the bullet and look at taking your B+E course & test. not only will you gain the new licence, but the information gleaned from the instructor is very beneficial. If you like the Zafira then change it for a 1.9 diesel like mine and I towed a 1450kg caravan with it. SeaDog - maybe in the future! I have no doubt it would be enlightening..
WispMan, I hadn't considered upgrading to the 1.9 diesel zafira, what is the MAM of that and relative towing capacity? The PLATED maximum weights for the caravan and car must be under 3500 kg when added together . 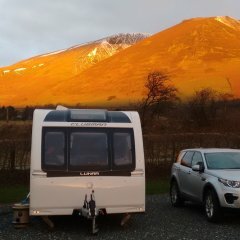 I would look at older 4 berth caravans that are lighter than 1100 kg not having the mod cons that add weight like the newer models and something like a Sprite Alpine .